Can our students afford to wait for each of their individual teachers to wake up to the realization that it’s well and truly the 21st century? How long will our governments continue to invest in 21st century ICTs if they don’t see any tangible return on that investment – especially since individual teachers in large proportions continue to, at best avoid and at worst, shun ICTs? 1. Give computers to every student. 2. Build the expectation in the community that they will be used in school. 3. Shame teachers into action/change. This is in stark contrast to the ICT investment of the past dozen or more years where the intention was rolling out computers and software to schools in order to lower the computer-to-student ratio. There was never any clearly expressed outcome that all teachers would increase their ICT-skills as a result of these rollouts – their use has always been an option, and as I’ve said before, if you give teachers an option, most will opt-out. Twelve years of rolling out over 600,000 computers to schools in New South Wales has proven this loud and clear. How can Australia as a society commit to and spend billions of dollars on computers for students without educational outcomes attached? How can schools absorb so many computers in such a short period of time and make them effective – or rather, essential tools for learning? How can teachers reinvent themselves to be relevant in a world where their students have information on tap giving them the power to contradict the “infallible” knowledge of the teacher at the front of their classroom? What is the teacher’s role in this new 21st Century classroom? What curriculum, assessments and measurements do we need to implement to complement the ICT resources our students now have ubiquitous access to? How big is this problem? Consider your own school. What percentage of teachers at your school fall into the ICT-avoider description? Although it’s expensive, the sledgehammer approach is hopefully going to be the lightbulb moment that teachers need to shake them into action. I believe the reckoning point will be at the end of 2010. Coinciding with Australia’s next (scheduled) Federal Election and only half-way into this four year “revolution”, there will be the evidence needed to either justify or pull the plug on this ambitious and much needed change in school education. We don’t have three more years to make this work, we have just one. The days of teachers expecting their professional development being handed to them on a silver platter are gone. The individualized and self-regulated, professional learning network is far more efficient, effective and relevant to teachers today. 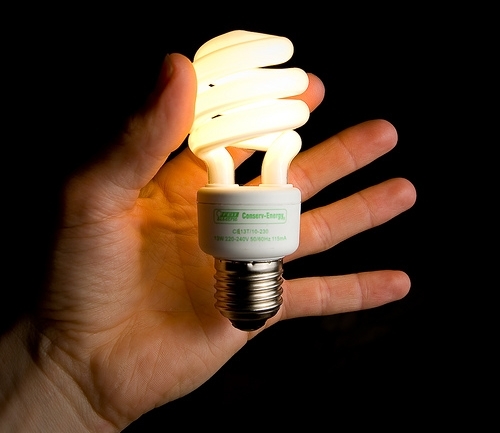 But before teachers can turn on their professional learning network, they have to have their own lightbulb moment. Sadly, here we are at the start of 2010 and only around 10% of the light bulbs are actually illuminated. Although the DET approach has been a sledgehammer – it at least has created action. I work in a private school in NSW and it has had access to the Rudd Government’s DER funding and chose not to spend on laptops but rather on additional ‘computer labs’. Our whole ICT committee chose to ‘opt out’ of the ICT issue in curriculum and now a handful of teachers at my school (not even 10%) try to keep up with sound pedagogical use of ICT in their subjects as well as in-servicing a very resistant remainder of the staff. My enthusiasm for ICT is often mistaken for the annoying yaps of a puppy and I regularly go back to my classroom and sigh very very loudly. Thanks for keeping the issue alive. Hopefully more can ‘get on board’ in 2010. A spike in ICT-based PD, coupled with a spike in early retirements followed by a realization by teachers that they don’t have to know everything about these laptops and what’s on them, only how to use one aspect of them effectively and how to control a class full of them and finally an grudging acceptance that their previous teaching methods are no longer relevant in 2010. Now whether they can convert that to changed teaching practises and lifelong learning, we have to wait and see. Of course, here we are only looking at this massive project from one perpective – the point of view of the teacher. But we also need to analyze it from the students’ and the assessment viewpoints. An excellent comment and a finely honed set of necessary questions. I think the approach is working but I think the shaming teachers into action is a misconception. Certainly teachers are vulnerable to shame and I’ve noticed that some of the avoiders actually feel ashamed of their lack of skill. Working with them requires a compassionate and supportive approach, unless they’re active subverting digital education. I believe the “shaming”, while not specifically highlighted anywhere in the project plan (just in this article), is an important aspect in driving this change. Think about it – this is THE biggest top-down implemented project for change in schools ever and the usually trigger-happy union is nowhere to be seen. Why? Because the community would be against any industrial action by teachers against DER – especially since probably close to 100% of teachers voted FOR a “digital education revolution” by electing Kevin Rudd on this exact platform. The expectation is now clearly in the community and our students will be the first judges. I agree totally, the principal/school executive MUST be a driving force. If the leadership is negative about this project, it is destined for failure – or at least stalling until the leadership changes attitude. As a teacher yourself, responding to an ed-tech article while on holiday in Jakarta via your “always-connected” iPhone, I can tell that your light bulb is well and truly lit. Stu, what you say is broadly correct. Perhaps pressure, even moral or professional pressure might be a better terms than shame. Unfortunately ‘shame’ has other psycho-dynamic implications that I won’t go into here, it would be in large part a digression. The point on the union is well made. I must say, when I returned to full time teaching I was shocked that the union hadn’t taken a leadership role, and dismayed to learn that, for a time, there was such intractable opposition to email. I feel that the approach to computers adopted in many schools has been far too ‘industrial’, partly this has been driven by the focus on the technology and people regarding computer labs as the best approach. I’ve always favoured the notion of computers being an essential part of class room process. The DER approach and the wireless access begins to take us in the right direction. I am always connected and I’m enjoying the prospect of a more direct dialogue with peers, students and the community about the ‘digital education revolution”. 10% of the lightbulb lit? That’s very generouse Stu. Take tch representation on Twitter as an example, perhaps <5% sadly. Vincent, 10% may be somewhat generous, but I don’t think Twitter representation is the only benchmark. Whether it’s 5% or 10%, the point is we have a long way to go and very little time to get there. I do not think that representation on twitter is indicative of the lightbulb being switched on. I know many teachers who have just been switched on!! but like all learners need to take steady steps….following the seven stages of change (Fullan) I don’t think that they will be confident to join twitter for a little while. I believe that newly switched on teachers will also need to be shown that there is a value in “twittering”-as they are at present quite overloaded by just what is available!! I agree Audrey. Twitter’s usefulness is still problematic to me. I registered because of Stu and others’ enthusiasm and have found some interesting leads or links but frequently find the comments baffling or of no interest. Admittedly I don’t follow a huge number of people and I can understand that this might be why it hasn’t grabbed me as yet. Note that many of the links or leads I have found I have also found through other sources (forums, delicious etc). I have introduced the concept of Twitter to my (now ex) staff by declaring that I was a Twit and pointing them to examples. They promptly agreed that yes I was a twit and as far as I know haven’t really explored it. As you point out they haven’t really seen the value yet and to be honest, neither have I, but I struggle on. In my experience, teachers will embrace something that they feel they can DO and will improve how they teach. We had a data projector at my school about 7 years ago (very expensive then) and it was virtually unused because nobody really knew how to use it. It remained unused until about 4 years ago when I started using it in the Library as part of my new role as librarian/tech person. When people saw it being used and could see the benefits, they all wanted one. As you say, small steps at a time. Frustrating perhaps but necessary. It ain’t tech itself. I mean, teachers use mobile phones, iPods, gadgets, social networks etc etc. For my two cents, it is the ability, no wait, the willingness to share. Share ideas, resources, strategies … you know it. I sometimes fear we are a bunch of bloody zealots but then I turn around, check the realities of society, workplace and my own conscience and the fear is easily overcome. Every term, I run multiple ICT Information Days for all of the public schools in my region (230 or so). On average, one teacher per school attends – that teacher usually has the title of “ICT Coordinator”. This person is the one who is responsible for ICT operations in the school and is usually a pretty good ed-tech teacher themselves – but – and this is particularly evident in the high school space – these people are also “the keeper of the keys at their school”. Nothing happens with ICTs in their school without their knowledge. ICTs are their magic bag of tricks. So they attend these information days, they gather all the information we provide – that is MEANT to be shared with the rest of their staff – but they keep it all to their chests. “This is MY professional development!” – It’s all about reinforcing their powerbase. DER NSW is shaking that powerbase and exposing their past practises which are now clear as day and many ICT Coordinators are not happy about it. These people could have made a huge difference in the 12 years leading up to DER NSW by helping prepare their school and fellow teachers for this radical change, but sadly, they chose not to for the reasons given above. The point about ‘gate keeping’ is an important one. Partly this is a structural consequence of hierarchical decision making systems and this has been the way schools have operated for a long time. Fortunately this is a relatively easy problem to get around with good communications. It’s important that you published the results of the ICT meetings digitally. I make sure the information from the ICT meetings is publicised in digest form via email, in fact I keep up a constant email stream and it’s interesting just how it’s beginning to catch on. People come to me and comment or they send return emails. I know this isn’t all that innovative, but just beginning to use email is still a big thing for some teachers and the growth in digital awareness and competence, when nurtured, can be quite rapid. I’m a very new uptaker of ICT. I was led into it by a mate – an ICT Integrator – not at my school. He started me with a Twitter account last Easter so I could follow my areas of Sporting Interest. It was great and gradually I checked out other teacher tweets and links. I now have a long list of bookmarks – a Delicious acc – which I’ve got to learn to use. I’m now considering that a blog is necessary to share. Our teaching staff have all had laptops for 4 years, there are 3 computer labs abot 3 class sets available in the library, and a few other class sets on various departments around the school. Not very many projectors and were about to get 16 IWBs this year. I’ve often wondered at the wisdom of providing laptops to staff without showing people how they can be used (or at least checking what people can do) but that’s another story. All this led me to ask our Curriculum Coordinator last November (09). How many staff of 90 use their laptops in the class room – with projectors, assignments using wikis etc. He said “about 5”. That’s not a big number. Fortunately with the arrival of more laptops for kids there seems to be more interest from some staff to find out how to use them in more imaginative and collaborative ways. Some of this interest was generated by the ETA Conference which was attended by about 4 English staff. Despite my interest and already passing on lots of stuff I’ve found to various depts I regard myself as about a 3Watt globe – the type that screws into old torches. The bright side (pun intended) is a little light goes a long way in a dark space. So this year I’m going to try and find out where we’re headed and who else is on the same path as me and see how we go. Keep up the flow of info. I love it. Thanks for sharing your story Bernard! It’s a similar situation in most schools – there is an expectation from parents that computers and the internet will be available in school, and schools and education authorities are making them available, but unfortunately it all seems to stop there. Having the “stuff” is only part of the solution. Actually using it appropriately as an essential tool is a whole different ball game. You can’t give out laptops to every staff member without a reason for doing so – without expecting some outcomes – at that comes down to leadership and the will to change – accept, adopt and adapt. I wish you and your school all the best for the journey ahead. WHatever you do, work together – don’t work as islands. In my experience – and I work with teachers of all ages – those teachers (generally older ones) who appear to be techno-phobic just need a little support and encouragement to get started, followed up by access to appropriate equipment for classroom use. I think a lot of the issues you have identified can be related to the rate, quality and process of changes (or reforms) required of educators. Too much change creates a huge and unsustainable burden that is rarely (if ever) justified by significant benefit – except, perhaps, in the short term to those initiate the change (or reform). After all, who can build a sturdy house on constantly shifting sands? Agreed Irene. But you have to admit that the past 12 years of constantly rolling out computers to schools have done little to promote needed changes in teaching. So that rate was not effective. One of the most-inspirational teachers I know is the Teacher Librarian at Rockdale PS. She’d hate for me to say it, but she is WELL beyond the normal retirement age, yet she is THE ICT leader at that school and has been so since she volunteered to be the Computer Coordinator for the school when no one else would back in 1997. That was a time when IT was problematic, software was complicated and access was limited. Today, IT and ICT is a completely different story – it’s EASY. In fact, it’s beyond easy – it’s natural. Age is not the problem – it’s attitude. I am also a T-L who (& please keep this between you and me and your kazillion blog-followers) could have opted to retire over four years ago. I try hard to keep up-to-date with ICT and am entirely self-taught. So, let’s hear it for ‘mature’ T-Ls … yaaaay! However, let us also be clear about the fact that most T-Ls in 1990s were, like me, thrown into the technological deep-end (remember OASIS v.1?) with very little or no training. It was learn or burn. Also, unlike most classrooms (and, of course, there will the exceptions that make the rule) computers and ICT have been integral to the operation of school libraries for nearly two decades. That has simply not been the case in the majority of classrooms. Stu, my remarks are not intended as a criticism of the view you have expressed. It’s just that I think it is easy to forget that equitable access to computers is still an issue in public primary schools. In my experience, once teachers have ready access to technology and provided there is a capable and enthusiastic CC at school (We have Pixeltoy. Who could ask for anything more? ), they use it. And … yes … it is now EASY SQUEEZY 🙂 I could not do without it! I have not been in this job long enough to know the history, and how the situation has come to be. But, my one observation is this: Teachers have not been given their own, individual computer until now (and I’m not sure that DER netbooks are the answer for teachers). I observed a group of older teachers in some training with an Adobe app on the last SDD days. These teachers could hardly use a mouse, nor navigate files. These are not the ICT-avoiders, but the ICT-no-chances. My Dad is close to retiring, like many teachers. Unlike many teachers, he is any active computer and internet user. Why is he different to so many teachers? My Dad had his own computer on his desk at work many many years ago. Gradually, everything moved over to being on the computer, then they were networked. A slow process, a gradual development. So, for at least a group of teachers at my school, their need is for an intensive upskilling in just using a machine. Stu, on your second last paragraph about professional development. Unfortunately, the Institute of Teachers NSW mandates that for New Scheme Teachers who have been certified at the Professional Competence level, 50 hrs of Institute recognised professional development is to be completed (over 5 years). This equates to sit down training courses. Another 50 hrs is “individualized and self-regulated, professional learning” or teacher-identified (mind you, I haven’t yet tried to get writing a reflection on a blog approved as teacher-identified yet). Those agitating this revolution, the Government or more precisely Politicians, still want to measure things. Apparently, teachers maintain competence if they do 50 hrs of approved by someone (but not necessarily any good) training. A revolution has to be more than giving every kid a netbook, the system in which teachers and students are working in must shift as well. Thanks for your reflection Simon and for highlighting some of the other issues that aqre contributing to the problem. I’m interested in knowing though – how is it possible that there are teachers (aka professionals) in 2010 who are still unable to use a mouse? Was this a failure of the individual teacher to keep up with teaching resources or a failure of the school leadership to identify and address these rudimentary training needs? Some were Teacher’s Aides, so I guess a little different. But one was the STLA, a teacher. I really don’t know how it is possible, I guess in their roles they have less need to use a computer (e.g. not having to enter report information). Any documentation from the STLA that I’ve seen has been hand-written. But, even Teacher’s Aides need DER awareness, they’re working directly with students who have a machine. “individualized and self-regulated, professional learning network is far more efficient, effective and relevant to teachers today” …………..YES YES YES YES YES YES yes yes yes yes yes yes yes !! Too often we see reference to organized PD sessions, hours, usually one off / face to face sessions. Measurable … (hours, tickboxes) but how effective? Little recognition given to PLN, collaboration, personalization – essential for lifelong learning, relevance in the 21st century. Greater awareness and recognition needed at many levels re value of professional learning. Hi SouthOz. You raise an important point here… I’ve presented so many formal hands-on PD courses for teachers and a common request I get at the end is “Do I get a certificate?” – no matter how trivial the course may have been. Teachers are generally speaking, obsessed with “qualifications”, but what formal qualifications do you get from your PLN? That’s where we need to change perceptions all round and ensure that employers put higher value on teachers with extensive, varied and distributed PLNs than those who may have been to a one day MS Word course and have a certificate to show for it. New Scheme Teachers are not in a position to agitate against the 50 hr Institute Recognised rule. Institute Recognised PD is costing the DET (and other systems) a lot of money, yet it’s often not “efficient, effective and relevant”. But, the only way to get my hours to stay a teacher is through sit-down training courses. Young and new teachers that I’m talking to are very frustrated with the rigidity of the NSW Institute, it’s a distraction from the core job of teaching. Well if that’s the case, the NSW Institute of Teachers needs to update its own requirements and recognise that trackable, public, informal PLNs and personal blogs are clear evidence of keeping up with PD – and that in a proactive sense rather than reactive. The value attached should well exceed the untested attendance at some mandated training session. This issue of PD is important and I agree with all of the above especially to the rather questionable relevance of many of the courses where there is no guarantee that any “development” took place. Of course the problem then is, how does one quantify learning taking place by other means? “The viewing log allows you to make videos you watch count towards your Continuing Professional Development. Watch videos, record your initial thoughts, return to update your notes when you’ve tried implementing ideas in the classroom, and download and print a record of how you have used videos as part of your CPD. 1. Watch a video, make initial notes on how the good practice, resources, and tips featured can influence your own classroom practice, help you implement new education policies, or inspire you to address wider issues around your school. 2. Once you have tried using the information in your own work, you can return to your viewing log to enter reflective notes on your experiences. The UK Education system has made many mistakes (I feel) but this appears to be a positive move to me. Thanks for the site Ian. We definitely need teachers to be able to track their own self-training and development, but also for that to be recognised by others as valid and effective PD. There’s the challenge for the system. Love your imagery and how it has inspired yet more interesting images in comments. The choice of “sledgehammer” to describe the DERNSW approach is in my view, accurate and I applaud the courage and will, that has underpinned the emerging success of our model. This is one of the points I wrote: the pace of change in what constitutes effective teaching practice is seriously challenging most teachers. This has resulted in a dire need for many to update their practice. The notion of being a lifelong learner has never been so relevant for genuine educators. This is a non-negotiable, individual responsibility. Finally, the three “sledgehammer” points you articulate are spot-on! I’m pleased that you liked it Elaine. The “softly-softly” approach of the past decade and more has been expensive and ineffective. It’s taken federal intervention to allow the state of New South Wales to make this step, but I’m still concerned that the federal intention of a “digital education revolution” is impossible to achieve across the country as each state and independent educational authority seems to be going their own way. The National Curriculum needs to take hold soon and highlight the path forward for all school in Australia. The content of your post has occupied my thoughts for a decade and I agree, the softly softly approach has not paid dividends. Having said that, most teachers had classrooms devoid of internet access, computers, laptops, IWBs, data projectors and the tools of a modern society. This is changing due to the DER and teachers, being pragmatic, are starting to see the potential as well as the reality of what this means in their classrooms. Professional people must engage, as You and Judy suggest, persoanlly with their own PD – not wait for it to come a knocking! I believe in distributed, or flat models of leadership but the reality is, in our hierachical systems, that not enough of the senior executive in schools, SEDs, RDs and other senior people are engaged with digital technologies in an open way, leading the way. Leaders need to lead and model, being the change they wish to see in others. Leaders need to insist that the staff, their colleagues, need to be active life-long learners. Students and parents need to ask the hard questions of their schools. I feel that the DER ‘trojan horse’ has helped us to open the gates. Lets get cracking in twenty-ten. Thanks Darcy. I agree, in many high schools, computers and internet were not put into general classrooms – just into the computer labs – but these were local school decsions to do this. Some high schools did cable up their classrooms and most if not all definitely provided access in every staffroom as many school admin systems needed to be accessed by teachers. But even still, many teachers chose to avoid the ICT access the was provided. Well, there is no longer any place to hide. The students have their wireless laptops front-and-centre. The leadership must be strong in this regard, and as you say, they MUST model it themselves if they expect their staff to do it. According to the Australian Government, Twenty-Ten is the Year of the Girl Guide (I kid you not – check here: http://www.alp.org.au/media/0809/mspmsow310.php ). According to what the country needs, Twenty-Ten should be The Year of the Connected Teacher. your encouragement and support of Det staff has had far reaching positive results-far more than you will ever realise. Over the years I have followed your guidance I have been able to see great progress finally blossom at our school. This year every one of our 14 teachers was keen and ready to integrate digital learning into their classrooms. As you indicated it has taken years of steps to get where we are now!! Without great support from our Principals from 2004 we as a staff would not be where we are today. Expectations were made when we were given our own laptops 5-6 years ago. Team learning has helped as staff became more confident. a yappy enthusiastic leader who gave very willing of her time whenever there was any interest from any staff member helped to spread the learning. strategy. As a primary TL there was a great opportunity to excite the kids with various learning experiences and then share those with their class teachers. Loved your questions… need careful consideration…..
Will be adding a link on this entry of yours to my teacher talk blog for sure!! Thanks Stu for continuing to push for what is possible for our students. Hi Audrey, I got some tweets from @wsr_ssp who disagrees with you (and me) and believes everything is just dandy in 21st century teaching. Poor fellow didn’t like my article, but also didn’t want to comment here. But Audrey, you are clearly an inspiration at your school. What you are doing needs to happen at every school. We need one (or more) teachers to stand up and be ed-tech champions. The change has to happen locally. Individuals must change, and the best way they can do that is with local support – everyone working together and also leveraging off their extended PLN. I’m really pleased it’s been working for you at your school. Some great discussion above that all teachers in nsw det teachers should read. In my experience, the teachers that are ‘having a go’ at technology and are willing to learn ways to integrate ICT into the curriculum are generally passionate teachers who became teachers because they want to make a difference to the lives of their students. These teachers are also generally great primary teachers or great at teaching their 7-12 subject. Generally, teachers who are hiding from ICT are generally lazy teachers who are in the job as they can get away with the 9-3 hours and as we all know, you cannot become a life long learner in ICT working 9-3. I am a perfect example, I feel I know very little about computers but I enjoy having a go and learning with my students. I found it is easy to integrate into the curriculum and when in doubt, ask your students for the many wonderful educators willing to share their knowledge. So to get more light bulbs to turn on? Is it possible to make teachers more passionate about teaching? Are they there only because of the school holidays? Is it time to make teaching like the real world and have teachers justify their positions at the end of a contract? Federation would never allow this, however it would allow the unmotivated to ‘sink’ and the passionate teachers to swim with technology river. Hi Craig, and a Happy New Year to you. Thanks for your comments. They certainly add to the others and the original post making this whole page a worthwhile resource for inquiring teachers to visit and ponder. I think if we keep pushing the message – “it isn’t hard!” and showing the possibilities, the professional teachers out there will be inspired, they will try it, they will see possibilities, they will adopt and they will adapt. DER NSW certainly seems to be the catalyst we needed. Other states take note! I have followed Stu’s discussions (this and others) for many years and have great respect for his opinions and abilities. On this current discussion I find myself agreeing with many points but have reservations about others. I wasn’t going to comment until I read your comments. Two of your generalisations upset me. First, you generalise that teachers who are “‘having a go’ at technology and are willing to learn ways to integrate ICT into the curriculum are generally passionate teachers who became teachers because they want to make a difference to the lives of their students. These teachers are also generally great primary teachers or great at teaching their 7-12 subject.” This is bunkum. Not every teacher who “has a go” is a great teacher. In my experience, many of the “tech experts” are simply blowing their own trumpets and embracing the technology for their own benefit and not necessarily that of their students. Much of education today has become pure window dressing with ordinary or poor teaching being glossed up by “technology”. A school well known for its use of IWBs and technology near me sends us students in Year 3 who haven’t even been on the internet in school; they don’t even know their DET username or password. We have our kindergarten students using the internet by Term 3. I also love how the word “technology” has been hijacked. In my lexicon, chalk, blackboard, pencil, paper etc are also “technology”. Second, and this is the one that got me responding, you state that: “Generally, teachers who are hiding from ICT are generally lazy teachers who are in the job as they can get away with the 9-3 hours and as we all know, you cannot become a life long learner in ICT working 9-3.” Wow, I am almost speechless at the arrogance of such a statement. Yes, some teachers are lazy, as for all sectors of the workforce. If we take Stu’s hypothesis about 5% or 10% being lit up that means that you are saying that around 90% of teachers are lazy. Of course you’re not lazy because you’re passionate about ICT so that makes you OK. The fact that you’re not particularly knowledgeable doesn’t really matter (although you are in a position where one would have hoped that you would be knowledgeable). Finally, I am uneasy about the constant attacks on teachers and their (supposed) unwillingness to embrace technology. Please note I am speaking for Primary schools as I haven’t had a lot of experience in Secondary and I know Stu feels that this is where the main issue is. I have been teaching for 36 years. When I went to Teachers’ College, some of my technology training was learning how to make “jelly pads” for stencils (no photocopiers) and threading film through a projector. Since training I have stayed abreast of many of the new technologies coming in (although I have never owned or intend to own a mobile phone) and am probably the most knowledgeable in technology at my school (or old school as I am now retired). I have seen many good and not so good teachers (not so many lazy teachers) and rarely have I seen a correlation between passion about ICT and effective teaching. Of course one of the greatest problems is people saying “it isn’t hard”. This is the classic mistake an expert in a field makes when teaching another. The mark of being a good teacher is seeing the pitfalls or blocks to learning a skill and teaching it. To many teachers, computers ARE hard, especially when we consider the DET’s ad hoc approach to inservicing and implementing procedures. My last Principal was completely left behind by the DET’s electronic communications etc (InPrincipal). She had no idea about much of what was happening because communications were simply bundled into an electronic message. She would forward me emails without the attachments that actually had the documents. The Annual School Report was a nightmare for her. Could I really be critical of her for not knowing all this stuff? Possibly, but I don’t know how much the DET trained her. She definitely didn’t have the skills when she was appointed to the position. Which brings us to the point of the “real world”. My brother in law works with the RTA. If they gave him a new piece of machinery (like a chain saw or tractor) they would train him how to use it. If the RTA wants him to gain a new skill, they train him in a professionally run course, in work time and they then reward him by an increase in salary or allowance. Stu makes the point about the DET putting computers into school. Yes, but the training and support was negligible. I was 3 years trained and then did a degree externally in my own time. When I graduated (and was considered more qualified) I moved up a scale to 4 year trained and gained an increase in salary. My salary has been stagnant for over 20 years no matter how much I have learned or been trained. Actually it isn’t stagnant, it has dropped. Every time we go to the DET for a new award, they say yes you’re wonderful and worth a million dollars but we’re going to offer less than inflation; so we have to strike and make a big fuss. 2. Not all teachers who are confused or reluctant to use ICT are lazy. 3. The DET generally has not supported the use of ICT with training or a planned approach. The DER in some ways is better but what I am reading is still failing in the training and support field. I agree with you. It is both foolhardy and arrogant to measure teaching excellence and/or laziness against technological expertise or passion, especially in primary schools where teachers must be competent generalists. It is unproductive to argue which KLA is the most important in primary education (and all, of course, may be enhanced in some way with the use of ICT) because ALL are important. While I recognise the importance of sport to the physical and social development of children, for example, I am not passionate about teaching it. Does that make me a lazy teacher or simply part of a diverse professional group with varying strengths and weaknesses? Thanks Ian, I was concerned that in all these comments there didn’t seem to be an opposition view and that the doom and gloom being portrayed was total reality. It’s pleasing to see your stance posted to provide a bit of balance to the argument. I think Craig did over-generalise in his comment on being “lazy”, but as an ICT leader at his school, you can see his frustration is borne from his experiences – so without him saying “IMHO”, you can read that it is “in his humble opinion”. Stu you make some interesting points and observations about the uptake of ICT within schools. I have been involved in education for 30 years. I first got involved with computers in 1983 my second year of teaching at Maroubra Bay High school, It was the placement of an Apple IIe in the admin area, quickly followed by the creation of a computer Lab full off Apple IIe’s, strangely the instigator for this initiative was a Social Science teacher. I have spent my teaching life working with other teachers pushing the virtues of ICT and how it can be used to engage students and enrich their learning experiences. The problems and dilemmas you raise know were apparent then and likewise there was a small percentage of teachers that embraced this technology and used it to engage their students. It is true DET has been putting Technology into schools for the past 12 years and have also witnessed the slow uptake or unwillingness of my colleagues to embrace it. One of the flaws I see is the lack of technology within the classrooms. Labs are fine and serve a purpose and need to continue, but as a teacher I need the technology at my fingertips, to use it when needed to enrich a lesson. Over the past 3 years things are changing with the introduction of IWB’s, LCD projectors in class rooms, availability of the internet, wireless connectivity throughout the school and now the DER-NSW revolution. At long last we have it at our finger tips to use when ever and where ever. Teachers are users of technology, especially in the areas of administration; they just not clear how it can be used in the class room. We may feel threatened with the loss of control over the students through the loss of traditional teaching methods. We also fail to realize because a kid might be looking at multiple sites, playing games and learning at the same time does not equal a lack of engagement, on the contrary, watching my own kids has made me realize their ability to multi task whilst staying focused. Teachers can no longer ignore ICT and its importance in the class room, about one third of their student population by the end of 2010, will be demanding it, talk about a sledge hammer well here it comes. One possible solution to lack of take up by teachers is not just PLN’s but also schools need to develop Learning Coaches that will support their colleagues in the effective integration of technology in the class room. It is not just about the pedagogy, teachers need to let go of their old methods and embrace the new era. In fact lots of our traditional classroom pratices are valid we just need to modify them to allow the seamless integration of DER-NSW into the classroom. DER-NSW equals change and the feeling I have it has begun and will continue. Who will benefit, Australians all. Hi John, You have an important job (together with your team) in our region to make DER NSW work. Your background and your passion will help see this through. We must remain supportive of teachers and we must keep talking about this. Sometimes you just need to hold the current situation out in the cold light of day – exposed for the whole world to see. We can’t keep sugar-coating the problem and hoping teachers will just naturally come along. The sledgehammer is here right now. Teachers can’t ignore it any longer – but if they just look a little wider, they’ll see a wealth of support and help ready for them – if only they choose to accept it. I agree that there is plenty of help available for teachers, but a supportive executive is absolutely necessary for any school-wide change and a principal interested in innovative learning can make a huge difference to a school. The focus should be on improving educational outcomes and in my case I think our school needs to have someone like a head teacher of teaching and learning who could help advise our teachers on how to bring student learning tasks into the 21st century. There needs to be a whole-school approach to make the DER a success. Unfortunately many teachers will always be resistant to change but ultimately I think that all DET teachers should have a commitment to lifelong learning. Adaptation to technological change is necessary and I think it is futile to resist change. It’s a shame that the Institute of Teachers can’t ask “established” teachers to participate voluntarily in a scheme that will encourage them to keep up-to-date with professional learning. maroubra bay high school! i was there… class of 83. Yes, we should all be very critical of anyone who cannot work ‘inPrincipal’ out in such a key position. It is unforgiveable and pathetic on a number of levels, especially considering what is asked of teachers and students. Professional people seek ‘development’ in the areas they are feeling need ‘development’. DET would have assisted her, as would many on the staff. Stu continues to ‘stir’ with this post but unfortunately, the people who should read it will never find it! Yes, I agree. In many ways I was critical of her and feel that she was appointed to a position above her ability (via “MERIT” selection but there’s another can of worms). However the point I was trying to make was that she was appointed to a position with a certain skill set and the skills required changed. I had some sympathy for her situation. This sympathy was reinforced by the way that much of the progress in ICT was implemented by the DET. The DET technology setup has always confused me and reminds me of a hydra with many heads (not always talking to each other). It is my supposition that this comes from the unhappy marriage of TAFE and the Dept. of Education. With the introduction of Webservices and the secure internet (passworded) concept, we had the strange scenario of TWO portals to use. We also had TWO different email accounts. School Based Student Reporting (SBSR) has stumbled onto the scene. We trialled it for some years and had great difficulties, to finally give it away in favour of Easy School Reports. Our Basic Skills Results (I know the name has changed) were available online to download with fantastic analysis tools, using the SMART software but getting them to install properly (especially on a Mac) was not easy. She did get assistance from staff, a great deal initially from a lowly paid clerical assistant. It was only when this assistant resigned that one saw just how much was done by her. In many ways though, training someone like her in ICT would be a bit like teaching calculus to a HSC student who hadn’t learned the rudimentary concepts previously. I note also that yes there is professional development available. There are the My Training areas in the Portal. I have tried them (and also the Oasis Palm island tutorial) and found them difficult. She would have had no chance. No topic is dead, still plenty of readers of this article according to the stats, but a lot has been said in the 40+ comments here.